From the springs of Paraspori it is a short hop to the village of Achladia which, in Greek, means pears which is as good a reason as any to stop by the side of the road and take a look at some wild ones. Now you may think that a pear is a pear is a pear but there are over twenty different species of wild pear to say nothing of the three thousand or so varieties that have been cultivated from just three of those species; Pyrus communis being the one we are most familiar with in Europe and America. This one however is not Pyrus communis but Pyrus spinosa, the Almond leaved Pear. One of the main differences between the two species, which I feel duty bound to point out before you finish filling your bag with them, is that these are not only inedible but toxic. Foraging is a delightful hobby but can be deadly. A golden rule should be Never assume that you can consume. And now to a plant that is not only edible but deliciously quaffable when fermented and bottled. As far as I am aware there are no poisonous grapes but before you go a-snaffling have you checked that they haven't been sprayed with something unpleasant? Just a thought. We are now in the wine making area of Sitia where some of the best wines in Crete are produced (yes, we can try some later – in the spirit of research of course). Wine has been made on the island for maybe four thousand years  and Ariadne, the daughter of King Minos was fond of a glass or two with Dionysos and, seeing as he is the Greek God of wine, he should have known where to come for a good tipple. Everyone has a grapevine so lets take a closer look at this one straggling along the fence at the edge of the car park (grapevines are not fussy about where they grow). Now here's a familiar face poking out from beneath this leaf, it's the caterpillar of a Vine Hawkmoth Hippotion celerio. At first glance one may think that this is a large eyed caterpillar with a ferocious stinger about to decimate the grape harvest but it's all smoke and mirrors. The eyespot is pure mimicry to confuse predators and has no physiological function at all. Similarly that stinger is purely decorative as well. Leastways no-one has found a function for it as far as I know – it certainly doesn't sting. In fact it is quite soft to the touch. 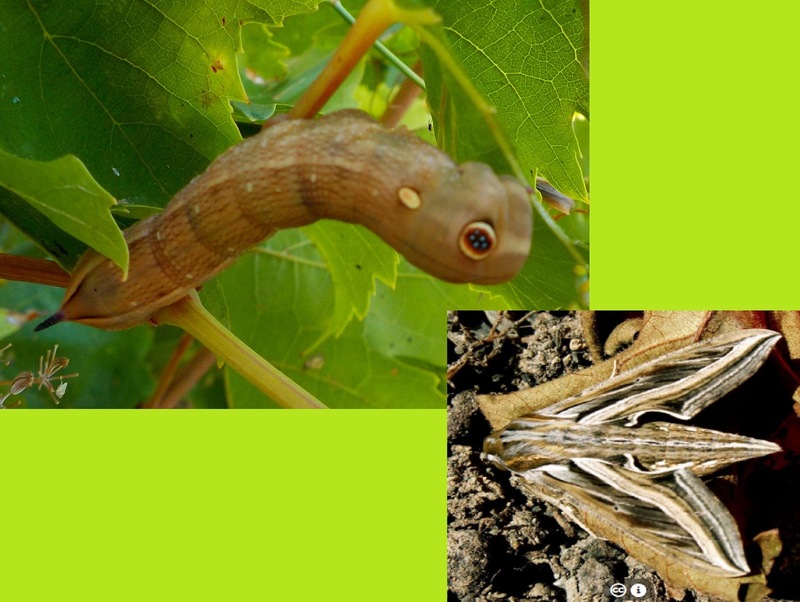 All caterpillars of the hawkmoth family have them and in some countries they are known as hornworms (a misnomer as they are not worms at all of course). Finally, he's no great pest to the grapevine. If you remember I had one on my grapevine back in May which I named Jeremy. He ate seven leaves before he pupated and they soon grew back. Incidentally I promised to show him to you when he emerged but I'm not sure that I ever did so here he is. Splendid looking fellow isn't he? Now, what else do we have? This beautiful piece of geometric artwork on the underside of this leaf comes to us from our old friend the Shield bug. Each of these little cells contained a single egg with a provision of food from which emerged a miniature adult bug, albeit with different colouration to its final livery. I count about one hundred cases here, each with a tiny lid, and it would appear that about seventy of them hatched which isn't a bad success rate. I'll take them home and see if there are any late developers but don't hold your breath. I think that this clutch is done. That seems to have exhausted the possibilities of this little vine so let's wander back through the village and have a quick look at the flowers. Many of the flowers that you see adorning the villages don't appear in Cretan flora guides for the simple reason that they are not native to the island. What you see here for instance (no, not the taverna) is an Hibiscus, Hibiscus rosa-sinensis which is native to Africa and Asia. One of its more unusual local names in India and something similar in Indonesia is the Shoeblack plant as it is used by the street side shoe-shine boys in the pursuance of their trade. I must try it on my next annual shoe cleaning day. Meanwhile the taverna beckons and so I suppose we must go and research these local wines. It's a tough job but somebody has to do it. I took those egg cases home but as I suspected no more shield bugs emerged. 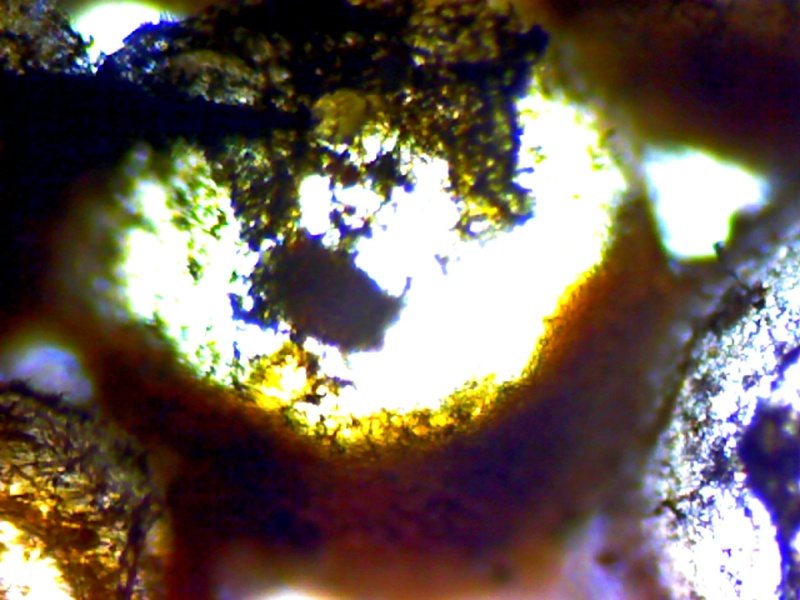 It did however give me a chance to examine them under the microscope and, as you can see, some of the bugs started to develop but didn't quite make it. Meanwhile Iris is still clinging on to the fennel by the gate despite some wet and windy weather and managed to catch a hoverfly in mid air last week. 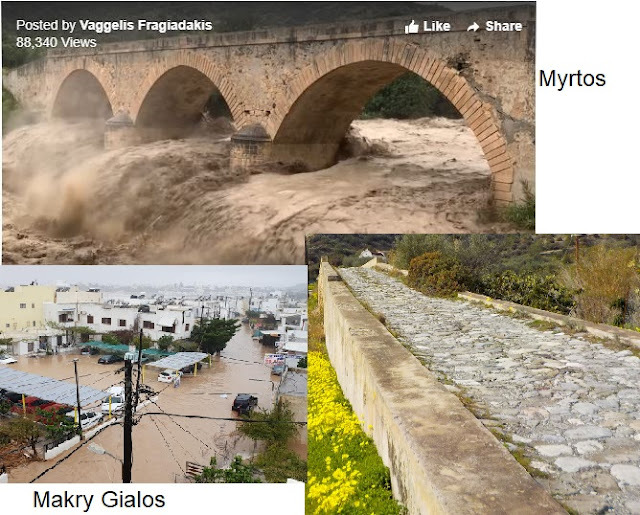 History of Wine in Crete (with thanks to Dill Childs via Flowers of Crete for correcting my earlier assertion that wine had been produced on Crete for a mere 2000 years). Many of you have asked me what photographic equipment I use so here's a quick rundown on the cameras used for each picture. For details of aperture settings, shutter speeds etc. my pictures will be on Flickr within a few days and that has all the geeky stuff. Pictures were edited with FastStone Image Viewer and combined with Microsoft Paint.